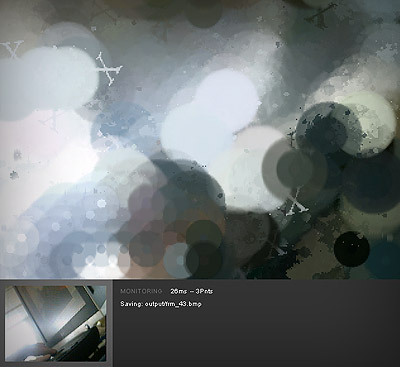 Uploaded, a quick test of re.drawer a feed from a web cam. (Yup, you will need a web cam connected to run this example!) Now load’s brushes in which are held loose on the server. By Electrolyte Posted in flash, labs You can follow any responses to this entry through the RSS 2.0 feed 2 Comments	Responses are currently closed, but you can trackback from your own site. any chance you can post some source code? What a great effect you got there going, I wish the final output could be scallable.